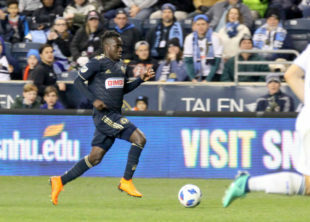 With seven goals total, the Union beat Chicago Fire last night in Bridgeview, Illinois, 4-3. With Burke scoring twice, I wonder if Curtin will finally bench Sapong. Ray Gaddis made his 150th career MLS start last night. Trivia time: Marcus Epps spent over two years in Chicago playing for the Fire’s academy and PDL teams. Union Academy goalkeeper Kris Shakes was honored last weekend with a Best XI nod for the Eastern Conference of the U.S. Soccer Development Academy. I love the way the Union play, and I love the ethos of the technical staff. Jim Curtin deserves a ton of credit for trusting the Homegrown central defensive combo of Auston Trusty and Mark McKenzie, but it’s more than that. He puts out a team with a very good gameplan on both sides of the ball pretty much every single weekend, and it’s usually pretty, and it’s often very effective. Except in terms of putting the ball in the net. Because the Union have been abysmal in front of goal in 2018. That’s what happened this past weekend as Philly mostly outplayed Atlanta, but then lost 2-0. What they could’ve done better: In retrospect, they bet on the wrong attackers. England played brilliant in the first half, but Croatia owned the second half with whatever Beetlejuice-Beetlejuice-Beetlejuice they’re drinking. Final score was 2-1. Croatia will face France on Sunday at 11 AM (FOX & Telemundo). Bethlehem Steel’s inaugural trip down to Gwinnet, Georgia didn’t end well. They lost to Atlanta United II, 2-1. West Chester United topped Junior Lone Star FC on penalties and will travel to New Jersey on Saturday to play FC Motown in the NPSL playoffs. Villanova released their men’s soccer schedule. Registration for Olympic Development Program tryouts are open. NYCFC defeated Montreal Impact last night, 3-0. A Chicago billionaire Joe Mansueto bought a 49% stake in the Chicago Fire. However, owner Andrew Hauptman maintains control and a place on the MLS Board of Governors..
D.C. United traded Patrick Mullins to Columbus Crew for $150K in TAM. Also in DCU news, some of their supporters are unhappy about the ticket policy as Audi Field opens this weekend. Toronto loaned struggling midfielder Ager Aketxe to a Spanish club. Minnesota United signed Colombian Angelo Rodriguez as club’s second DP. NYCFC U-19s defeated LA Galaxy to win the Development Academy title. And in the U-16/17 final, the Seattle Sounders beat Atlanta United. Hartford Athletic up in Connecticut will join the United Soccer League for the 2019 season. The International Combine for the Women’s Premier Soccer League is coming up. Arsenal signed Matteo Guendouzi, a France Under-20 international midfielder. Dortmund signed teenage defender Achraf Hakimi from Real Madrid on a 2-year loan. Didn’t Accam play for Chicago? Until proven otherwise, last night was what’s it called in football circles….. a one off is it. Nonetheless, good job winning game- what was with that Chicago keeper though? Yes. I was happy to see him celebrating his game-winning goal too. Stick it to ’em!!! If Curtin managed consistently, we’d never see Sapong start again. A brace for Burke should win him the starting job permanently. Yet, I’d bet a box of doughnuts Sapong is in the starting XI for the next league match. England, man. Wasn’t rooting for anything but good football yesterday but still kept getting frustrated with that team’s inability to get anything done in the final third. It was practically Union-like. They had no idea what to do whenever they got in the box. Can’t help but think it’s just silly for MLS to play through the World Cup. Are people really going to watch Atlanta/Seattle or Portland/LAFC on Sunday after the Final? Maybe they figure there’s a carryover audience…. I dunno. If Burke wins the starting job permanently, aren’t we then just in the same inflexible situation just with a different person? That was an ill-considered use of the adjective “permanent” there. Meant that Burke earned the job and should be a starter until he loses it. Last two games after world cop game were rate quite well. Burke would be a welcome change up front. CJ is really struggling and lost. Burke is just miles ahead right now.